THANK YOU FOR VISITING OUR ONLINE STORE! WE ARE A TEXAS BASED MANUFACTURER, DISTRIBUTOR, AND IMPORTER OF THE HIGHEST QUALITY CONCHOS, HARDWARE, AND LEATHER. EVEN THOUGH WE TRY TO KEEP OVER 2,000,000 CONCHOS IN STOCK WE STILL RUN OUT OF SOME OF THE MOST POPULAR STYLES ALMOST AS SOON AS THEY ARE PUT ONLINE, SO IF YOU DON'T SEE WHAT YOUR LOOKING FOR KEEP CHECKING BACK. NOBODY AND WE MEAN NOBODY CAN COME CLOSE TO OUR SELECTION OF CONCHOS AND HARDWARE. WE HAVE OVER 1,500 DIFFERENT COMBINATIONS OF CONCHOS AND FINISHES, AND WITH OUR EXCLUSIVE TRIGG LEATHER ADAPTERS YOU CAN MAKE ANY CONCHO INTO A ONE OF A KIND PENDANT, BRACELET, AND MORE. 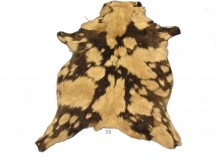 WE ALSO STOCK HAIR ON HIDES, ODD LOTS, AND EMBOSSED / PRINTED LEATHERS FROM SOME OF THE WORLDS BEST TANNERS. Copyright © 2005. Trigg Leather.